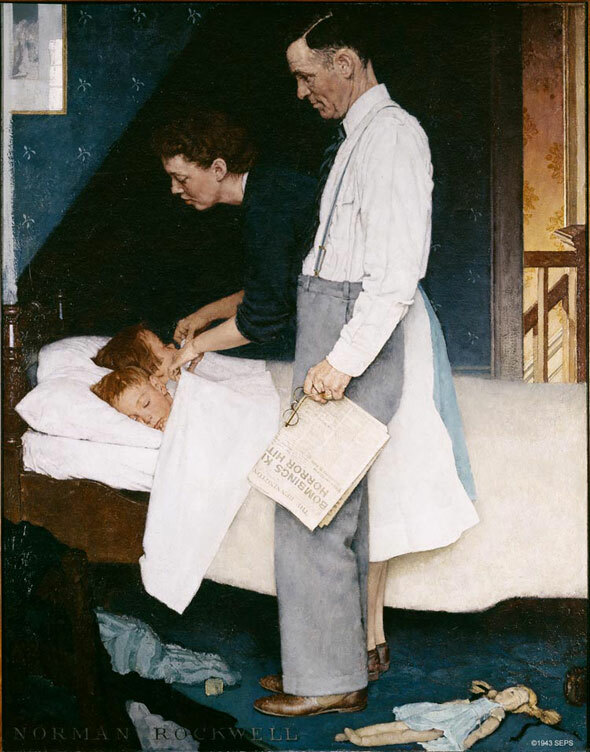 What Kind of Father Was Norman Rockwell? Rumors about Rockwell as a self-absorbed artist and negligent father abound, but Abigail Rockwell returns to the Post to set the record straight. What to do with Father’s Day?! Why is Mother’s Day easier? Chocolates, flowers, brunch, and a card and Mom is usually satisfied. Fathers can be more difficult, they don’t mean to be — their gifts sometimes require more thought; more of a search is involved when thinking of a way to show our love and appreciation for Dad. Why? Often, depending on the generation we grew up in, our relationships with our fathers may not be quite as demonstrative and immediate as they are with our mothers, yet they are as deep, layered, and important. No matter how progressive we get, we will still look to our fathers to help teach us how to move and operate in the world — we look to them for those specified tools in learning how to fully function and flourish in this dizzying and increasingly complex world. In this past year and a half of investigating my grandfather’s life and work, one important aspect I needed to explore and discover was what kind of father Norman Rockwell really was. The Rockwell biographers have invariably painted him as a negligent dad, totally self-absorbed. Yet in my grandfather’s paintings, a very different kind of father emerges — a father who is present in his children’s lives. Norman Rockwell began painting in the earlier part of the 20th century when the roles between men and women were more clearly and restrictively defined. Yet what kind of father do we see in some of his most beloved paintings? 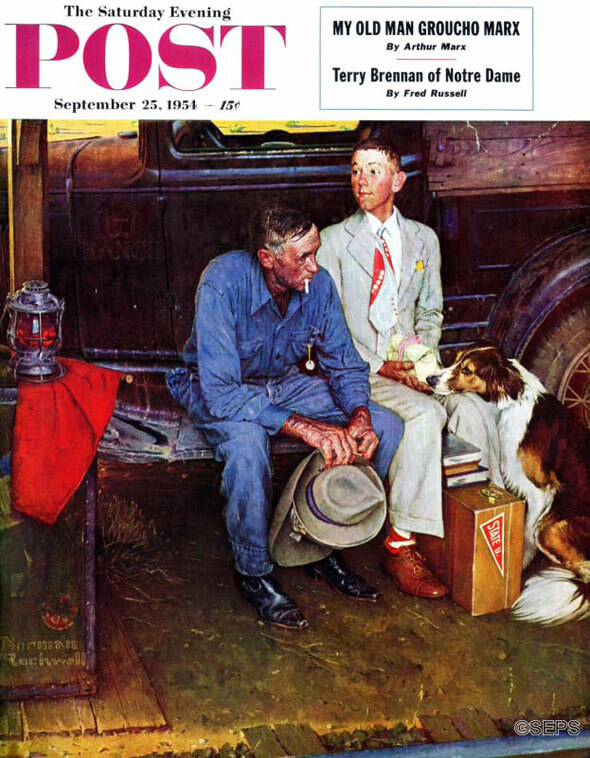 My two favorite fathers NR painted are the man sitting on the running board of an old truck with his college-bound son in Breaking Home Ties (1954) and the father holding a newspaper, standing over his sleeping children with his wife in Freedom from Fear (1943). The idea for Breaking Home Ties apparently came from Pop’s sadness about his two younger sons leaving home for college and his oldest entering the Air Force. The loss felt by father and dog is palpable and contrasts with the quiet expectancy of the young man waiting for his ride and the future ahead of him. NR started the story idea with the mother, father and son but then changed it, leaving the mother out of the final painting — more deeply and clearly portraying the unspoken bond between father and son. Nothing needs to be said — it is all in the collapsed body language of the father, the erect carriage of the son, and the loving, forlorn face of the the dog pressed into his leg, hoping against hope to make the young man stay. The dark earthy tones with the pops of red convey the mood instantly. The red flag under the lantern reminds us of the excitement of the coming train. That red is picked up in the son’s socks and tie and in the college sticker on his bag. The careworn, weathered face of the farmer father, a cigarette dangling from his lips, denoting a certain toughness or reserve that covers a gentler, more emotional side. What says it all? The father clinging to both of their hats — his broad-rimmed, more utilitarian hat and his son’s newer, more contemporary fedora. The father’s worn boots; the son’s new, carefully polished shoes. The farmer, the passing generation; the son, the aspiring next generation. Breaking Home Ties was completed during the darkest period in the family history. A few years before my grandmother, Mary, had a breakdown, which shattered the whole family. The father’s collapsed torso in the painting is a true indication of how my grandfather must have been feeling at this time. With all of his boys leaving home, perhaps NR also felt abandoned, at a loss. I adore the father in Freedom from Fear. He has a quiet strength about him, which his straight posture conveys, yet there is an unmistakable kindness in his face as he looks on as his wife carefully pulls the blanket and sheet up to cover and protect their children. This father is a thinker, a reader, his attire hints at an office job. The paper displays the horror that is occurring in the world in contrast to the safety and comfort of their home. The extraordinary care that NR put into creating the tangible softness and warmth of the blanket. The light coming from downstairs further instills a feeling that all is well. This father is a reassuring presence — he has answers, or if he doesn’t, he will consider and reflect and come to a discerning judgment and understanding. This is a father you can count on. My grandfather was not close with his own father — his father was wrapped up in his dependent relationship with NR’s mother, a very needy woman who was a hypochondriac. She was the one in the family who required and received most of the attention. Our fathers do the best they can. Let’s celebrate Dad by making his favorite food — black bean soup and fresh cornbread? — or going for a hike together (check for ticks please!). It’s the simple moments spent together that really count and remain with us. Warmest wishes to all fathers … especially my own Dad. Thank you Charles and Bob for your kind feedback. Bob — I actually did not know enough about my grandfather to know what kind of a father he had been, so I embarked on investigating it. In investigating anyone’s role as a parent you have to sift through things that were said — by family members, close friends, neighbors, newspapers, etc. — and then uncover family events, including crises, to discover how everyone reacted, etc. It is only then that you begin to have an idea of the true story. The mistake some biographers make is to listen to one disgruntled member of the family (there is usually one in every family!) and give their side far too much credence without investigating what lies beneath their skewed view of the subject. What I discovered is that NR was there for every small and big crisis in his sons’ lives — Peter’s almost fatal fencing accident at college, for example — he never absented himself and wrote of these trials emotionally and with compassion and depth. In the household of someone who is that successful and famous there is always a kickback reaction to that fame — each individual reacts and deals with it differently. Was NR the most physically demonstrative of fathers? Perhaps not, but again, he was a man of a very different generation from this one. As a grandchild, I don’t remember great big, demonstrative hugs from Pop, but what I do remember was that I felt absolutely loved, safe and taken care of by everyone, including Pop, in that household. Some of my fondest childhood memories were the times we visited Pop and Molly in Stockbridge. This really is a great article. You definitely would know more than any biographers the real truth about what type of Dad your grandfather was to your Dad and two uncles. It’s entirely possible that these writers may have made assumptions of negligence, being self-absorbed for various untrue reasons that because he was such a gifted artist and had SUCH a massive body of work, that he simply HAD to have the negative qualities they stated. It’s very bad when ‘biographers’ don’t get the facts correctly, make (or make up) false assumptions/negativities to either sell more books and/or knock the subject down a few pegs out of jealousy, which is a real abuse of the power of the pen. Unfortunately it does happen, and usually the person doesn’t have someone who KNOWS the real truth to intervene on their behalf as you’re doing, Abigail. 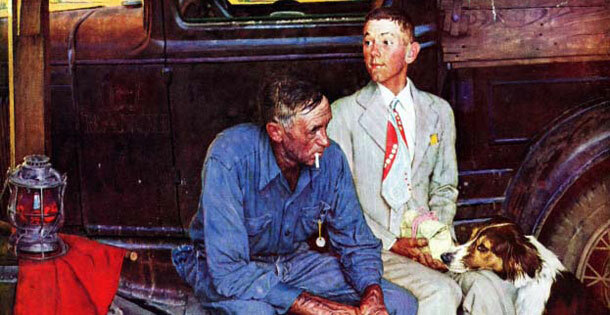 I love your insights into these two great Rockwell paintings also, of course. I’d been familiar with both for years, but now have a deeper appreciation because of this article. Interesting look at Norman Rockwell’s private life. Great article.